Endless vistas, unique wildlife, hidden waterfalls, and remote communities; Australia’s Top End is one of the country’s best kept secrets. From the rock art of Nourlangie to the great wetlands of Kakadu, this four-day package will reveal the secrets and surprises of this awe-inspiring region. Admire the changing landscape as you leave Darwin behind, travelling east into the heart of the Top End. Enjoy a spot of bird-watching at the Fogg Dam Conservation Area, take in the stunning view from the Window of the Wetlands, and spot wild crocodiles on a boat cruise at Corroboree Billabong. Stay three nights in a Bush Bungalow at the Mary River Wilderness Retreat, enjoying meals, sightseeing and relaxation. Discover the wonders of Kakadu on tour, including visits to Ubirr Rock and Nourlangie Rock, home to 20,000 year old rock art. Seek out secluded waterfalls, plunge into cool rock pools, marvel at the tranquil rainforest of Litchfield National Park and more! The Bush Bungalows have sweeping views of green lawns and a parkland setting. They all have a balcony overlooking the lush green grass and often wallabies grazing. The 4 star Mary River Wilderness Retreat is located 110km south of Darwin, just 39 kilometres from Kakadu National Park. This family owned and operated eco-tourism property features bush walks, river cruises and many other great facilities and experiences. Mary River Wilderness Retreat is the ideal base to fish and explore the Mary River, Hardies Lagoon, Shady Camp or the South Alligator. It is also a great stop over on Natures Way which takes in Kakadu and a range of other Top End attractions. Starting out from Darwin your journey begins by travelling east along the Arnhem Highway. Enjoy a pleasant stroll through the shade of mesmerising melaleucas and paperbarks at Fogg Dam heralded for its prolific bird life. A stop along the way at Window on the Wetlands will also open your eyes to many of the amazing wonders you’ll experience over the coming days. A boat cruise on the Corroboree Billabong known for the highest density of saltwater crocodiles is another crowd-pleaser. By late afternoon you will arrive at Mary River Wilderness Retreat, which will be your base for the next three nights. Unpack and make your bungalow a home away from home and have time to stroll the tropical gardens or have a relaxing dip in the pool. The retreat is also rich in fauna and flora with three kilometres of Mary River frontage and irrigated rolling grass hills home to many wallabies and birds. The retreat boasts walking tracks, bike, buggy and boat hire, a restaurant and two swimming pools. Meet the hosts and enjoy happy hour before dinner. Today is filled with the wonders of Kakadu’s ancient rock art at Nourlangie Rock, some of which is believed to be as old as 20,000 years. The escarpment and rock walls that have been the murals for this art is as impressive as the art itself. The views from Ubirr Rock across the wetlands into Arnhem land will leave you spellbound. Also, enjoy a stop at Bowali Visitor Cultural Centre. This morning feel free to start the day as early or late as you like! You will enjoy a wonderful cultural experience, free time and the chance to indulge in some optional extras, walks, take a boat on your own or simply relax by the pool with a good book. This afternoon enjoy a boat cruise on the Mary River aboard Tom Tough. The last day is packed full of excitement with a day trip to Litchfield National Park. Plunge into cool rock pools and cascading water at Florence Falls, Wangi Falls, visit massive termite mounds and see spectacular waterfalls. A tranquil rainforest walk makes for wonderful photo opportunities and a stopover on the way back to Darwin to sample homemade ice cream at Berry Springs is also on the agenda. Return to Darwin at approximately 6:00pm. If you plan on taking a flight out of Darwin after the tour, it is recommended not to book a flight departing earlier than 8.30pm this evening. Booking is subject to final confirmation from the accommodation provider. If you do not receive an email from the accommodation provider within 7 Business Days please contact TripADeal. If the selected dates cannot be secured, an alternative date can be selected. In the event no available dates are suitable, a full refund will be provided. Please refrain from booking travel arrangements prior to final email confirmation from the accommodation provider. Please note: All additional charges are payable direct to the Property unless stated otherwise. Travel offer is valid for travel until the 23rd September 2019. For solo travellers a mandatory single supplement of $240 applies (payable direct to the tour operator). Poolside Bungalows: $105 per room. - The poolside bungalows feature cathedral ceilings are fully tiled throughout and have large ensuites. Built in 2009 they are modern cool comfortable and clean. All have a queen sized bed and some with one single bed. 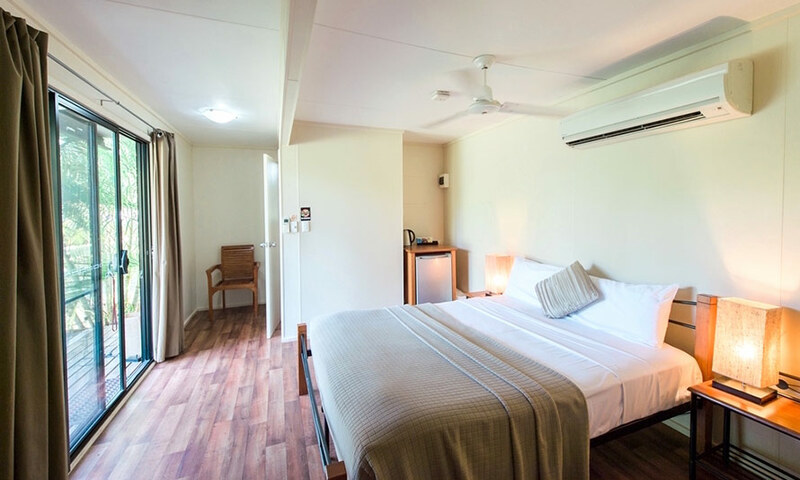 They are equipped with wardrobes, bar fridge, tea and coffee making facilities, ceiling fan and air-conditioning and all have a balcony overlooking the secluded pool area. Please note: if you wish to upgrade to the Poolside Bungalow, you will need to contact the hotel directly. Upgrades are subject to availability. - Valid for Children 13 years old and over. Minimum group size 12, maximum group size 32 per vehicle. Darwin City Edge Motel, 38 Gardens Road, Darwin at 9.00am. Darwin City Edge Motel, 38 Gardens Road, Darwin at approximately 6.00pm. - Prices are based on per person, are subject to availability, time permitting and weather conditions, and are payable direct to the tour operator. - Please indicate if you are interested in any optional activities in the special requests section on the Passenger Information Form. - Daily breakfast is a buffet. - Daily lunch is picnic style. - Daily dinner is inclusive of 1 x feature Roast Dinner (Day 1) & your choice of a meal from a selected dinner menu (Day 2 & 3). - Strictly no refunds for this package for amendments and change of date - fees are at the Tour operator’s discretion/ policy. - Please note that breakfast is not supplied on the first day of the tour. - All surcharges are payable directly to the supplier. - Yegge, from May to mid-June, is relatively cool (between 21-33°C) with low humidity. Early morning mists hang low over the plains and waterholes. - Wurrgeng, from mid-June to mid-August, is the 'cold weather' time. The humidity is low, daytime temperatures are around 30°C and night-time temperatures are around 17°C. During this period, most creeks stop flowing and the floodplains quickly dry out. You will enjoy three deliciously prepared continental buffet breakfasts, four picnic style lunches and three dinners including a delicious roast dinner on the first night of the tour (Day 1). It is your responsibility to notify TripADeal of any dietary requests/requirements. Please note; we will do our best to meet your requests/requirements, however cannot guarantee that we will always be able to. Please note: you must be able to walk up to 3 km on uneven surfaces unaided where necessary. If you have any concerns please consult your healthcare provider prior to purchase/travel. Please note: In the event entrance to a site is affected by changes in operating hours or public holiday closures, your itinerary will be adjusted to ensure you get a similar experience.